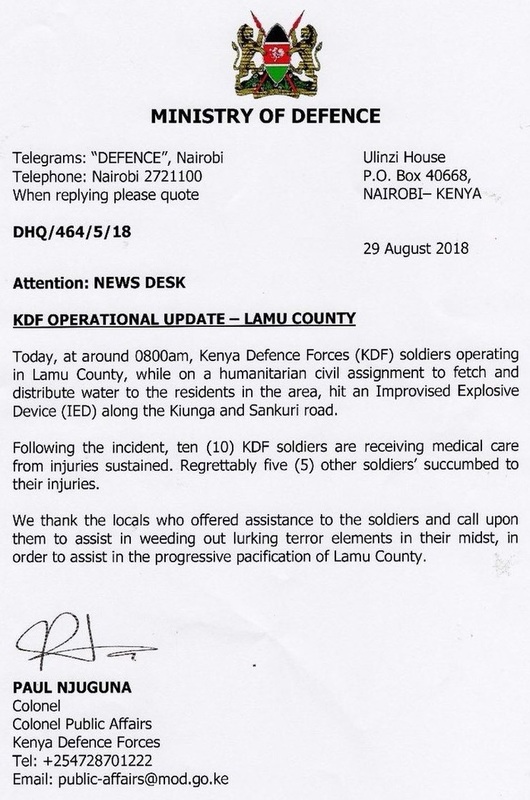 Wednesday August 29, 2018 - It is sad news for Kenya after the Somali dreaded group Al-Shabaab killed five Kenya Defence Forces (KDF) soldiers and injured 10. This is after a lorry they were travelling in hit an Improvised Explosive Device killing the 5 soldiers and seriously injured 10. 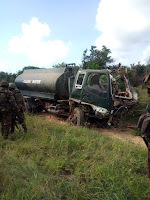 The incident happened on the Kiunga-Sankuri Road in Lamu County. The Wednesday morning incident happened at 8am when the soldiers were going on a humanitarian civil assignment to fetch and distribute water to the residents. Confirming the incident, the Ministry of Defence said in a statement that the 10 injured soldiers are receiving medical attention. "We thank the residents who offered assistance to the soldiers and call upon them to assist in weeding out lurking terror elements in their midst, in order to assist in progressive pacification of Lamu County," the Ministry said.